Great product! Love the colors! Fill your bedroom with the sweet and whimsical charm of the Urban Habitat Kids Ella Cotton Printed Duvet Cover Set. Adorable unicorns prance across the top of the duvet cover and matching shams in bright colors on a pink ground. The solid purple reverse highlights the fun print making it pop! Completing this 100-percent cotton duvet cover set are two decorative pillows that feature pleating details and an applique unicorn, for a magical finishing touch. Hypoallergenic filling in the pillows provide rich softness and comfort. Machine washable for easy care, this child's cotton printed duvet cover set will brighten your bedroom with its fun and playful look. Button closures, on the duvet cover, allow you to place a comforter insert within the duvet cover and four internal corner ties help prevent it from shifting (insert NOT included). Dimensions 88.0 In. X 68.0 In. X 0.13 In. Ordered for my daughter’s room; it’s adorable and the cotton is smooth and soft. We love the matching pillows, too! The colors are accurately shown, it’s a very pretty color palette and pattern, more interesting than the standard ubiquitous pink and purple pink and purple. I love it!! And the best part - My doughter LOVES it!!! It’s 100% cotton, I washed it with some fabric softener and it’s perfect. My daughter also loved the other Urban Habitat Unicorn set - Bliss Pink. So we got that one as well and combined the pillows. The collors are super fresh and go nicely together. 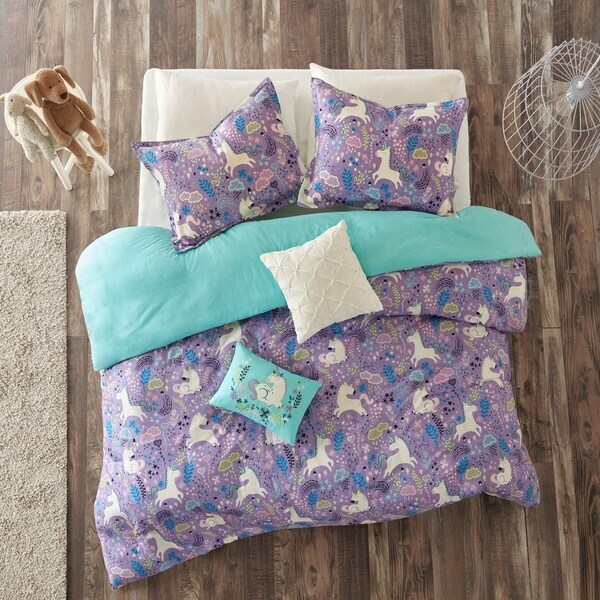 The print of this set is very cute, and my four year old daughter LOVES the pillow with the unicorn design on it. The fabric isn't very soft, though, which is why I'm only giving it four stars. I'm hoping it will soften with time. Amazing quality and so beautiful. Fit our queen bed perfectly and our daughter absolutely loves the unicorns. The accent pillows are a great addition too. Great colors and pattern, my granddaughter loves the set. Perfect set at just the right price for our daughter’s room. She loves it. Pretty but not very soft. I washed it but it's still pretty rough but my daughter loves it so we're keeping it. "are there sheets to match"